Join us for our opening evening on Friday 26th July from 3pm until our spectacular fireworks finale at 10pm. 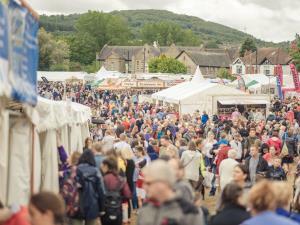 Our full programme starts at 11am on Saturday 27th & Sunday 28th July (stalls and food halls are open Saturday and Sunday only). You'll find all the action in and at the rear of Caerphilly Castle, Crescent Road, Caerphilly CF83 1AB. Entertainment is the life and soul of the festival with live music acts, choirs and dancers. Caerphilly Castle is transformed into a medieval encampment with re-enactment displays and battles. Visit our huge traditional funfair and craft stalls lining the Castle's moat. Children's activities are plentiful with animal encounters, crafts, displays and much more. M4 Junction 32, A470, A468.